INDEPENDENCE, Ohio -- Cavaliers guard Kyrie Irving drove past defenders with ease all season. It was no different in voting for rookie of the year. Irving, who played beyond his years and above everyone's expectations including his own, was chosen the NBA's Rookie of the Year on Tuesday, winning an award he always believed was within reach. "It was a goal of mine," he said. "I knew as long as we won some games and beat some great team that it was going to come." Irving received 117 of 120 possible first-place votes from a nationwide media panel of writers and broadcasters. Irving finished with 592 points, way ahead of Minnesota's Ricky Rubio (170) and Denver's Kenneth Faried (129). Faried, San Antonio's Kawhi Leonard and New York's Iman Shumpert received the other first-place votes, denying Irving's bid to become the fourth player to win the award unanimously. The 20-year-old is the second Cleveland player to win the award, joining LeBron James in 2004. The No. 1 overall pick in last year's draft was clearly the league's top first-year player, leading all rookies -- and the Cavs -- in scoring with 18.5 points per game. He also led all rookies in field-goal percentage (46.8), was second in assists (5.4) and became one of just six rookies in league history to average at least 18 points and five assists. However, it was the other elements of his game -- a nasty crossover dribble, a fearless desire to get to the basket, and a clutch, cold-blooded instinct in the fourth quarter that separated him from the others. During a sometimes funny and emotional acceptance speech, Irving credited his father, Drederick, and his late mother, Elizabeth, for raising him. He donated a car given to him by Kia for winning the award to the New Jersey Roadrunners, his former AAU team. Irving, who played only 11 games at Duke because of a toe injury before turning pro, regularly took over games down the stretch for the Cavaliers. He kept them competitive and in the playoff race until mid-March, when the team's front office decided to build for the future by trading his backup, guard Ramon Sessions, to the Los Angeles Lakers for a first-round draft pick. Once Rubio went down with a season-ending knee injury, Irving became the runaway favorite to win rookie of the year honors. And beyond his impressive statistics, Irving brought hope to the Cavaliers and Cleveland fans, who have spent the past two seasons trying to move past James, who left as a free agent before he could bring them their first league title. Irving appears to be the major piece the Cavs can build around, and they plan to get him some help next month with three of the top 34 picks in the NBA draft. The Cavs got lucky and won the draft lottery a year ago, paving the way for them to select Irving. He was clearly the perfect choice. "I can't wait to add some pieces this summer and see what happens next year with him," said Cavs owner Dan Gilbert, who opened his downtown casino Monday night. "He's great and the way he carries himself is really remarkable. He's 20 years old. That wasn't me at 20 -- or 40. He can't have a drink legally or come into our casino but he can do everything else." Despite having a limited training camp because of the labor lockout, Irving started the opener for coach Byron Scott, who has formed a strong bond with his young star. He believes Irving has just scratched the surface of his potential. "One of the easiest guys I've ever coached," Scott said. "Last year was a learning experience for him and us. I expect so much more from him next season and beyond." Although it was assumed Irving would start the season opener, Scott didn't inform him until the day of the game so as not to pamper the playmaker. But Irving had earned the job and it didn't take him long to show the Cavs and the rest of the NBA that stardom would be in his future. In just his third game, he had a chance to hit a game-winning layup at Indiana but rolled his shot off the rim. Still, Scott's decision to give Irving the ball in that situation was a sign the Cavs were ready to put their franchise in the then-19-year-old's hands. Irving said that moment of failure was the one he'll savor most from his first season. "It was a stepping stone for me," he said. "It was learning experience and I needed it." A month later in Boston, with his father sitting in a courtside seat, Irving had perhaps the defining moment of his season. With the Cavs down by two, Irving, ignoring his failure in a previous situation, drove to the basket, split two defenders and flipped in a left-handed layup to beat the Celtics. The next day he handled his heroics with humility that was on display all season. "Just a shot," he said. Irving arrived with none of the superstar trappings. There was no entourage or multimillion-dollar shoe contract, no cameras chronicling his every move. Irving chose to blend in. At the Rising Stars Game during All-Star Weekend in Orlando, Irving made all eight 3-pointers to win MVP honors. Posing for a photograph afterward, Irving lowered the crystal he was presented and told the photographer, "Make sure you get the Cleveland" on the front of his jersey. "That wasn't a publicity stunt at all," Irving said when the season ended. "I just wanted to make sure they got the Cleveland uniform in it. We're not as publicized as everybody else." As long as Irving's around, that will change. Associated Press. "Kyrie Irving wins rookie of year". ESPN. 15 May 2012. Web. Before they were Super Bowl champions and Pro Football Hall of Fame members, Art Monk and Dave Casper had successful college football careers. On Tuesday, Monk, who led Syracuse in receiving three times, and Casper, a consensus All-American on Notre Dame's 1973 national championship team, were named to the College Football Hall of Fame. Monk, who starred for three Washington Redskins Super Bowl winners, began his Syracuse career as a running back and shifted to wide receiver. He holds the school record for most receptions in a game with 14, against Navy in 1977. Casper, who won a pair of Super Bowls with the Oakland Raiders, played his first two seasons in South Bend on the offensive line before moving to tight end. He was a co-captain of the 1973 Fighting Irish team that beat Alabama in the Sugar Bowl and claimed the AP national title. Quarterbacks Steve Bartkowski of California and Tommy Kramer of Rice were also among the 17 players and coaches announced as part of the Hall of Fame's Class of 2012. They joined former BYU quarterback and Heisman Trophy winner Ty Detmer, whose inclusion in the Hall was announced Monday. Bartkowski led all Division I quarterbacks in passing yards in 1974, with 182 completions for 2,580 yards, while Kramer led the nation in total offense in 1976 with 297.5 yards per game. Both went on to successful NFL careers, with Bartkowski starring for the Atlanta Falcons and Kramer for the Minnesota Vikings. Coaches being enshrined into the Hall of Fame include Phillip Fulmer of Tennessee, Jimmy Johnson of Oklahoma State and Miami and R.C. Slocum of Texas A&M. Fulmer led the Volunteers to the first-ever BCS Championship Game title in 1998, and Johnson's Hurricanes went undefeated in the 1986 and 1987 regular seasons and won the 1987 national championship. Running backs Charles Alexander of LSU and Otis Armstrong of Purdue, tight end Hal Bedsole of USC, offensive tackle Jonathan Ogden of UCLA and offensive guard John Wooten of Colorado rounded out the offensive players announced Tuesday as Hall of Famers. Defensive players named to the Hall of Fame included former Kansas State linebacker Mark Simoneau, former Texas Tech defensive tackle Gabe Rivera, former Colorado State defensive back Greg Myers and former Air Force defensive back Scott Thomas. (CNN) -- Martin Brodeur was unstrapping his goaltending pads after another victory, about to be rushed to a TV interview, when a reporter on deadline made a request. Could he answer just one quick question? "Yes, I'm 40," Brodeur cracked, predicting the question before it could be asked. "For some reason, that's a big deal." Well, it actually is, and the reason is simple: Brodeur couldn't celebrate the milestone -- his birthday was May 6 -- because he was too busy notching another win en route to leading the New Jersey Devils to the Eastern Conference Finals. And now, as the playoffs move to the final two rounds, Brodeur has a chance to win the Stanley Cup at an age when most players already have hung up their skates and picked up their golf clubs. Turning 40 usually means collecting your gag gifts and waking up with a hangover and a realization: You're not as young as you used to be. For Brodeur, it means doing what he's done his entire adult life: winning hockey games at the highest level in the sport. No goaltender in NHL history has won more games than Brodeur: His 656 career victories are 105 more than Patrick Roy, who is second on the list. The next active goaltender on the all-time list, Roberto Luongo, has just 339, so it's a record that may never be broken. And no one has appeared in a playoff game in his teens and his 40s, which became another line on Brodeur's long résumé this week. He is the definition of longevity, and he's not just hanging on by the edge of his skates, either. "You go out, and you compete against players that are such a young age," Brodeur said during the Devils' second-round series against the Flyers, which they won in five games. "I'm more than twice the age of (Devils rookie defenseman) Adam Larsson. I mean, you kind of shake your head a little bit. "But you're able to play at a level when you're having fun and you're able to compete in a league you always wanted to play and still be able to keep going. For me, I don't take anything for granted. I appreciate every moment, especially this year. It's been awesome for me." That doesn't diminish what he could accomplish this spring. When Brodeur won his first Stanley Cup, he was just 23. Now, if the Devils continue their hot streak through the playoffs, he could win his fourth at 40. That would be a 17-year gap between his first title and his last one. There aren't many athletes who can match that, but two who did -- Kareem Abdul-Jabbar and Babe Ruth -- are recognized amongst the greatest in sports history. Brodeur is certainly among hockey's greatest. Along with his three Stanley Cups (1995, 2000, 2003), he's won two Olympic gold medals (2002, 2010) and the Vezina Trophy as the league's top goalie four times (2003, 2004, 2007, 2008). His ability to handle the puck behind the net changed the sport, leading to a rule change that restricted where goalies could play the puck. His critics have said that Brodeur benefited from the Devils' defensive approach for years. But his former role model -- who later became his biggest rival -- thought that argument was unfair. "I remember in the playoffs, he once said he was facing more critics than shots," said Roy, who owns most of the NHL goaltending records that Brodeur doesn't have. "I thought it was a nice way to deal with the pressure. From the outside watching him, he almost makes it look easy, but I know how tough it is." Roy retired in 2003, when he was 37. Brodeur is in the final year of his contract but has said he's leaning toward coming back next year -- his 20th in a Devils uniform -- "if they're going to take me back." He said he's having too much fun to stop now. "You have to enjoy what you do," he said. "I've been here for so long that I've had different roles regardless of me playing or not playing. Just watching guys and helping guys during their careers to make the right decisions. You have to think the right way and go through hurdles for success." The 40-year-old goaltender is doing what's he's done for two decades now: winning hockey games. About the only time he shows his age is when he counted the candles on the birthday cake from his family. There were only about 20 of them. Politi, Steve. "Sports' least-known all-time great" CNN. 11 May 2012. Web. Steve Nash has made his first big basketball decision of the summer, agreeing to become general manager of the senior men's national team for Canada Basketball. Nash, who will be a highly coveted NBA free agent this summer, will be introduced in his new role at a news conference Tuesday in Toronto. The arrangement will be similar to the one Wayne Gretzky had with Hockey Canada in advance of the 2002 Winter Olympics in Salt Lake City. Maybe the timing of this will seem a little bit odd because I'm still playing, but this is about trying to impact a bunch of kids, trying to be a good resource and a source of some good. "Obviously I love the program," Nash told ESPN.com. "It was a huge part of my development as a player. Going to the Olympics (in 2000) was the best experience of my career. "So if I can help other Canadians experience that, it would be pretty amazing. I want to try to lend my hand to help develop our system and change the image and reputation of this country internationally and be a resource for as many of our good, young kids as possible." Long known back home as "Captain Canada" after leading a team of unknowns to within one win of the medal round at the 2000 Sydney Games, Nash hasn't played for his country since the qualifying rounds for the 2004 Olympics in Athens. As part of his new job, Nash will have a strong say in the hiring of Canada's next coach. Former Toronto Raptors coach Jay Triano, who was in charge for the Sydney Olympics, is regarded as an overwhelming favorite for the post after he completes his summer stint as an assistant to Mike Krzyzewski with Team USA at the London Olympics. There is quiet optimism that Canada's basketball fortunes could be on the rise after Tristan Thompson and Cory Joseph were first-round picks in the 2011 NBA draft. Nash is optimistic the number of Canadians in the NBA could rise to double digits "in the next five years." "Maybe the timing of this will seem a little bit odd because I'm still playing (in the NBA), but this is about trying to impact a bunch of kids, trying to be a good resource and a source of some good. We have a lot of developing talent in our country and I'm excited to help them," Nash said. Nash will be assisted in the job by former Olympic teammate Rowan Barrett, who will run day-to-day operations as assistant GM. The next major competition for Canada's national team isn't until summer 2013, when it will try to qualify for the world championships, which FIBA is rebranding as the World Cup. As for his forthcoming return to free agency in July for the first time since summer 2004, Nash said: "I've been so busy with this that I haven't had much of a chance to start thinking about it. In the coming weeks, I'll definitely start to think about what I'm going to do." Nash, 38, told ESPN.com last month that he wants to play in the NBA for at least three more seasons. He's also said in recent weeks that he has not ruled out re-signing with thePhoenix Suns, but intends to test the open market. Suns owner Robert Sarver, meanwhile, told Phoenix radio station KTAR-AM last week: "If the situation's right, both parties would like to continue working together." Stein, Marc. "Steve Nash to become Canada GM". ESPN. 8 May 2012. Web. Kobe Bryant's pain ended up being charity's gain. The Los Angeles Lakers guard auctioned off the mask he wore this season after breaking his nose and suffering a concussion in the NBA All-Star Game to raise money for the Kobe and Vanessa Bryant Family Foundation. Jesse Johnson/US Presswire The mask Kobe Bryant wore while rehabbing a nasal fracture suffered during February's All-Star Game sold for $67,100 in a charity auction. The auction ended Tuesday with a winning bid of $67,100. The opening bid was $250, and there were 129 total bids. Bryant also autographed the mask before putting it up for auction. The money will go toward the Bryant Family Foundation's initiative to help eradicate homelessness in Los Angeles. There are nearly 50,000 homeless people living on the streets of L.A., and an estimated 7,000 to 10,000 of those homeless are younger than 24, according to the website for My Friend's Place, a youth homeless shelter that Bryant supports. Bryant wore the mask for 11 games in February and March of this season after a hit to his face by Miami's Dwyane Wade in the All-Star Game. He averaged 31.1 points per game and scored his 29,000th career point against the Minnesota Timberwolves while wearing the mask. Bryant said that wearing the mask felt like a sauna on his face and joked back in March that he planned to auction off the mask to "see if anybody's dumb enough to buy that sweaty mask." McMenamin, Dave. 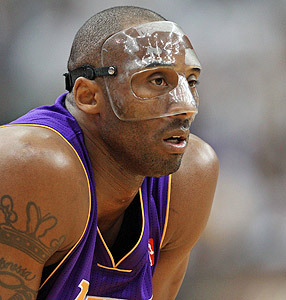 "Kobe Bryant mask raises $67,100" ESPN. 9 May 2012. Web. BALTIMORE -- Texas Rangers outfielder Josh Hamilton's torrid 2012 season now includes his first career four-home-run game, all of them two-run shots in a 10-3 win over the Baltimore Orioles. "Obviously it's, other than being in the World Series, the highlight of my big-league career," Hamilton said. Hamilton homered off Jake Arrieta in the first and third innings, added another off Zach Phillips in the seventh and topped it off with a one-for-the-books shot against Darren O'Dayin the eighth. During the last at-bat, Hamilton took a mighty hack and missed, lined a foul into the right-field seats and then sent an 0-2 pitch over the center-field wall. "I was saying after I hit two that I had never hit three in a game before. What a blessing that was," Hamilton said. "And then to hit four, it was just an awesome feeling to see how excited my teammates got. "It reminds you of when you're in Little League and a little kid, and just the excitement and why we play the game. Things like that. You never know what can happen. It was just an absolute blessing." It marked the 16th four-home-run game in major league history. Hamilton is the first to accomplish the feat since Carlos Delgado did so on Sept. 25, 2003, for Toronto against Tampa Bay. Two of the 16 players to hit four homers in a game did it before 1900. Hamilton is the sixth AL player to perform the feat. "History was witnessed tonight," Rangers manager Ron Washington said. Even Delgado was impressed, congratulating Hamilton on Twitter. "#Rangers Mr. Josh Hamilton very nice game. Welcome to the club!!!!!!! @shawngreen15," Delgado wrote, referencing Shawn Green's four-home-run game against the Milwaukee Brewers on May 23, 2002. Green also took to Twitter to praise Hamilton. "Thanks for all of the nice messages tonight..." Green wrote, "and thanks Josh Hamilton for getting people to remember me!" But Hamilton said it was hard for him to measure the magnitude of what he just did. "It's like anything else -- you do something good or something incredible happens, it takes a little bit for it to sink in," Hamilton said. "I think when I get away from everybody and I have some time to myself, I think it might then." Hamilton's record-setting night is the latest accomplishment in a career that almost never was. He went from first round draft pick in 1999 by Tampa Bay to out of baseball all together because of drug and alcohol addiction. He recovered and returned to the majors in 2007 with Cincinnati, and was traded to the Texas, where he has become a star -- the AL MVP in 2010 -- while still battling his addiction. He had a relapse before this season, but is off to a torrid start. "Understanding that what I'm doing and what God's allowed me to do coming back from everything I went through and allowing me to play the game at the level I play it, it's pretty amazing to think about," Hamilton said. It was Hamilton's fifth multi-homer game, but the first time he's hit four home runs in one game. The eight RBIs are a new career high for the slugger and his 18 total bases in the game broke the club record last set by Jose Canseco on June 13, 1994 against Seattle. The 18 total bases set a new AL record and was one shy of the major league record held by Green. Hamilton, who will turn 31 later in May, also added a double in the fifth inning. "As a player, you don't go out and try to do stuff like that," Hamilton said. "You play the game hard and try to do the best you can, and if you happen to break a record, that's great. But you don't set out to try to do that as a player." It reminds you of when you're in Little League and a little kid, and just the excitement and why we play the game. Things like that. You never know what can happen. It was just an absolute blessing. O'Day called the pitch Hamilton clobbered to dead center for his fourth home run -- an 0-2 sinker that didn't sink -- "the worst pitch of my career." "[The] guy's already got three bombs and I had him 0-2 and I throw it right over the middle," said O'Day, who was Hamilton's teammate with the Rangers in 2010 and 2011. "I couldn't have soft-tossed it any better to him. I'd like that pitch back for sure. You can't say enough about the day he had." Rangers pitcher Derek Holland marveled at his teammate, calling Hamilton "a freak." "He's unbelievable. It couldn't happen to a better guy. It's amazing to sit there and watch. I couldn't believe it," Holland said. Shortstop Michael Young said after Hamilton's first home run it was obvious he was locked in. "He earned it. Three to center and one to the opposite field. Those aren't garden-variety homers. Those are earned," Young said. "Just an incredible game. You could tell form his first at-bat he was locked. First-pitch curve ball from a guy that he hasn't seen all season. He hits it out. That's when you know he's seeing it well." Hamilton also hit a two-run home run in his final at-bat on Monday's win over Baltimore, giving him five such homers in his last six at-bats. "This is just a couple of games. This could get even better. We don't know," Holland said. "There's more to come. It's unbelievable to see what's going on with this guy." Hamilton, who is in the final year of his contract and could become a free agent after this season, leads the AL with 14 homers and 36 RBIs, and his 5-for-5 effort raised his batting average to .406. Durrett, Richard. "Josh Hamilton rips four 2-run HRs" ESPN. 9 May 2012. Web. Fresh off a mega contract, Calvin "Megatron" Johnson has landed the coveted cover of "Madden NFL 13." The Detroit Lions wideout beat out second-year Panthers quarterback Cam Newton for the honor. The vote was announced Wednesday afternoon on "SportsNation" on ESPN2. 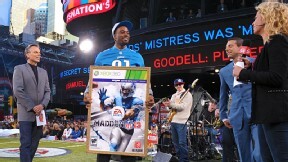 After nearly 20 million votes, Calvin Johnson beat Cam Newton for the honor of appearing on "Madden 13." Johnson, who won by garnering 52 percent of the more than 651,000 votes cast in the competition, said he was "shocked" by the decision. "Man, it's great," a smiling Johnson said. "Just to see yourself on this Madden (cover) and seeing all the guys that have been on Madden? C'mon, man." Although hugely popular, the video game carries the stigma of a "Madden Curse." Running back Peyton Hillis, then a member of the Cleveland Browns, won the fan vote last year, but was plagued by injuries and controversy in a hectic 2011 season. Hillis said before winning the "Madden NFL 12" cover that he wasn't afraid of the curse, but after rushing for just 587 yards last season, Hillis said in December that he now believes in the cover jinx. Johnson is coming off a spectacular season in which he caught 96 passes for a league-best 1,681 yards and 16 touchdowns. He became the third player in NFL history with at least 95 receptions, 1,600 yards and 15 touchdowns in a season, joining Jerry Rice and Randy Moss. The Lions, who made the playoffs last season for the first time in a dozen years, rewarded the former No. 2 overall pick with an eight-year deal worth up to $132 million dollars in March. Joe Faraoni for ESPN.com Calvin Johnson, center, won the Madden cover by garnering 52 percent of the more than 651,000 votes cast in the competition. Newton set the NFL on fire in his rookie season despite taking a crash course in mastering an NFL offense after a lockout wiped out most of the offseason. After being taken with the No. 1 overall pick in last April's draft, the quarterback that led Auburn to its first national title revitalized the Panthers, setting an NFL record for rushing touchdowns in a season by a quarterback (14) and becoming the first player in league history to throw for 4,000 yards and rush for 500 in the same year. The former Heisman Trophy winner was then named the AP NFL Offensive Rookie of the Year after the season. Other players to have appeared on the cover of the EA Sports game include Marshall Faulk, Michael Vick,Ray Lewis, Brett Favre and Drew Brees. The competition for the cover drew nearly 20 million votes, with Johnson beating out Dwayne Bowe, Arian Foster, Rob Gronkowski and Aaron Rodgers before the final showdown with Newton. ESPN News Services. "Calvin Johnson Wins Madden Vote" ESPN. 25 April 2012. Web.